You don’t have to do the practice exams in order, but most people tend to start at one and move forward in the number line. So I’m assuming that you’ve already bolted yourself to a chair for seven hours of testing — not all at one time, I hope. (If this is your first practice exam, turn to Practice Exam 1 in Chapter 20 and read the introduction for a few general guidelines.) After you have two exams in the rearview mirror, you probably know which areas are your strengths and which areas call for extra attention. Apply that knowledge to this practice test. Go a little faster through your best sections, and turn your concentration dial up to maximum when you hit the hard spots. When you complete this exam, dance or snowboard or tweet or do something nonacademic. Then check your work in Chapter 25 and use the scoring guidelines in the appendix to determine your SAT score. Note: The real SAT you take will have ten sections, instead of the nine you see here, because the College Board throws in an “equating section” that doesn’t count toward your score but allows the testers to evaluate new questions. The SAT doesn’t tell you which section is useless (to you). Because I’m here to help you score high on the SAT, I don’t include an equating section in any of the practice tests in this book. Nice of me, huh? For Section 1, use two sheets of loose-leaf or notebook paper to write your essay. 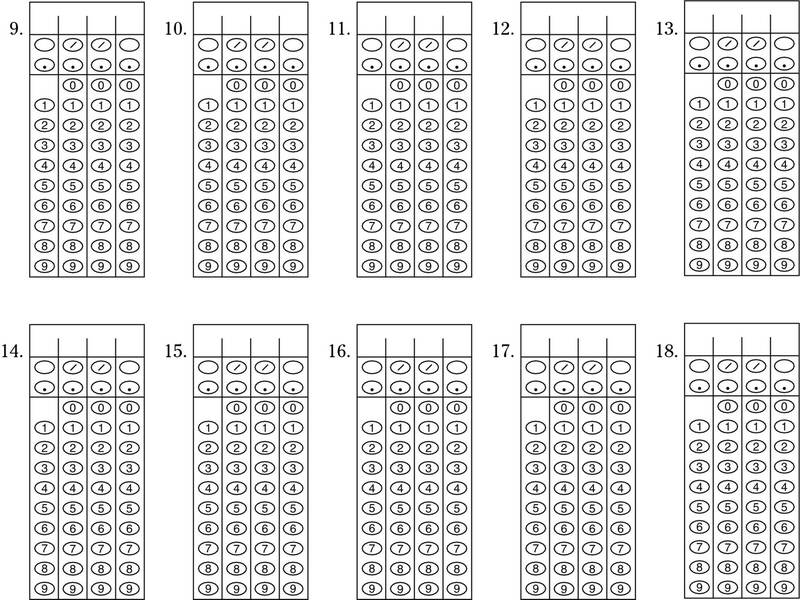 For the questions in Sections 2 through 9, use the ovals and grid-ins to record your answers. Begin with Number 1 for each new section. If any sections have fewer than 35 questions, leave the extra spaces blank. Directions: In response to the following prompt, write an essay on a separate sheet of paper (the answer sheet). You may use extra space in the question booklet to take notes and to organize your thoughts, but only the answer sheet will be graded. Does ambition help or harm? Should one attempt something that seems impossible, or is it better to create goals that are clearly achievable? In a well-organized essay, address these questions, developing and supporting your point of view by drawing upon history, literature, current events, or your own experience and observations. Directions: Choose the best answer to each question. Mark the corresponding oval on the answer sheet. 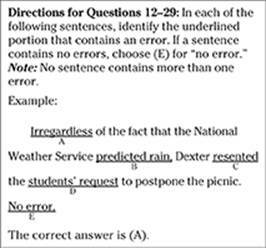 Directions for Questions 1–8: Select the answer that best fits the meaning of the sentence. Example: After he had broken the dining room window, Hal’s mother _____ him. 1. Because filmmaker James Woody is so identified with New York City, the announcement that his next film would be set in rural Oregon _____ critics. 2. The shy smiles of the celebrity _____ fans who believed that she was _____. 3. The resort’s marketing campaign was so _____ that it attracted not only the wealthy but also those of limited means. 4. The _____ of the cellphone means that workers required to carry them are never out of reach of their employers. 5. Ultimately the complexity of the subject demands a _____ approach instead of the generalizations _____ by that commentator. 6. It is essential, when new technology becomes _____, to examine its impact on society and culture. 7. He was a _____ reader, seldom without his nose in a book. 8. Success didn’t come to that executive _____ but rather as a result of years of _____. Directions for Questions 9–20: Choose the best answer to each question based on what is stated or implied in the passages or in the introductory material. 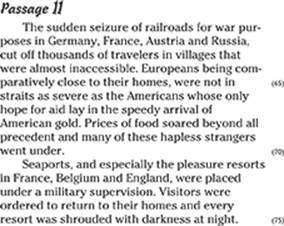 These two passages, from different authors, refer to events that took place during World War I. 10. 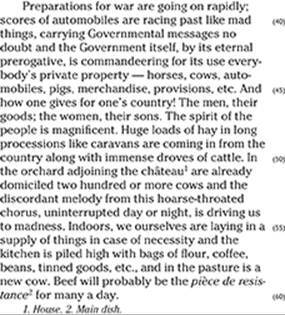 The “deadly earnestness” mentioned in Line 9 is illustrated by which of the following selections from Passage I? 14. Based on the comment, “We ourselves are laying in a supply of things in case of necessity” (Lines 55–56), with which statement would the author agree? 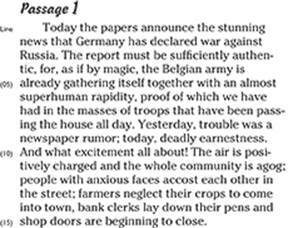 (A) Food supplies may be erratic in wartime. 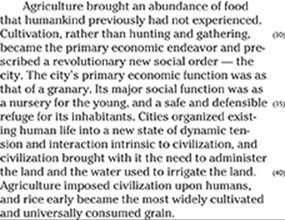 (B) In a farming community, food is a major source of income. (C) Food supplies should be stored in the kitchen. (D) The Government must stockpile sufficient food to feed the populace. (E) Every family is an independent entity. 18. What is the best definition of “want” in the context of Line 108? 20. 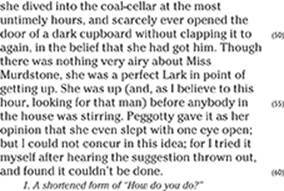 Which statement about these two passages is correct? (A) Passage I is more general than Passage II. (B) Passage I provides an overview, while Passage II is an eyewitness account. (C) Passage I is more personal than Passage II. (D) Passage II is narrower in focus than Passage I. (E) Passage I was written later than Passage II. Directions for Questions 21–24: Two questions follow each of the passages below. Choose the best answer to each question based on what is stated or implied in the passages. 21. According to the passage, in what way do people who live in the country differ from those who reside in the city? (A) Country people need more water. (B) City residents are more concerned about the cost of water. 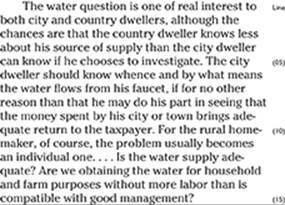 (C) Adequate water supply is not a problem for country people. (D) Country dwellers may recognize a problem only if their own water supply is affected. (E) City and country residents compete for water. In the light of day their breath of vague terror was dissipated. There was no place for mystery nor dread under this floor of brilliant sunshine. The smiling sapphire floor rolled ever on before us. . . . I had proven, almost to my own satisfaction, that what we had beheld had been a creation of the extraordinary atmospheric attributes of these highlands, an atmosphere so unique as to make almost anything of the kind possible. But Drake was not convinced. 24. 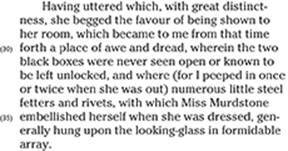 Based on the information in the passage, which statement might Drake make to the narrator? (A) The mystery is solved. (B) A new day improves every situation. (C) The unique weather of the highlands does not explain what we saw. (D) Sunshine has calmed my fears. (E) You and I agree about what we ­witnessed. Directions: This section contains two different types of questions. For Questions 1–8, choose the best answer to each question. Mark the corresponding oval on the answer sheet. For Questions 9–18, follow the separate directions provided before those questions. All numbers used in this exam are real numbers. All figures lie in a plane. All figures may be assumed to be to scale unless the problem specifically indicates ­otherwise. There are 360 degrees of arc in a circle. 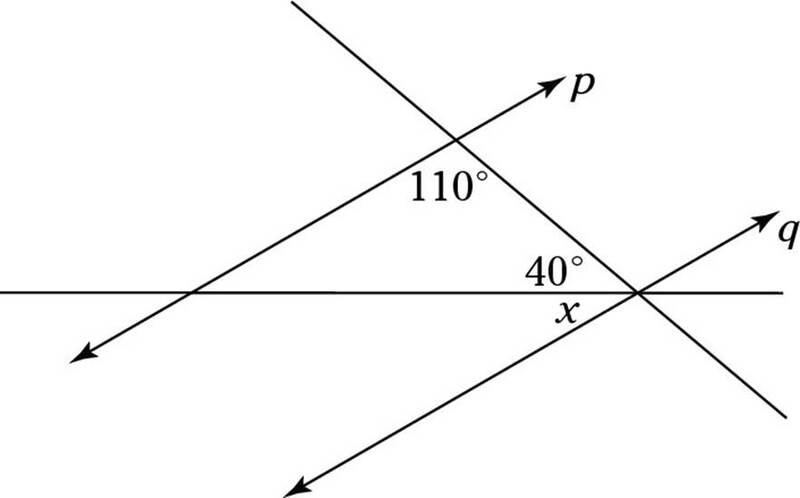 There are 180 degrees in a straight line. There are 180 degrees in the sum of the interior angles of a triangle. 2. 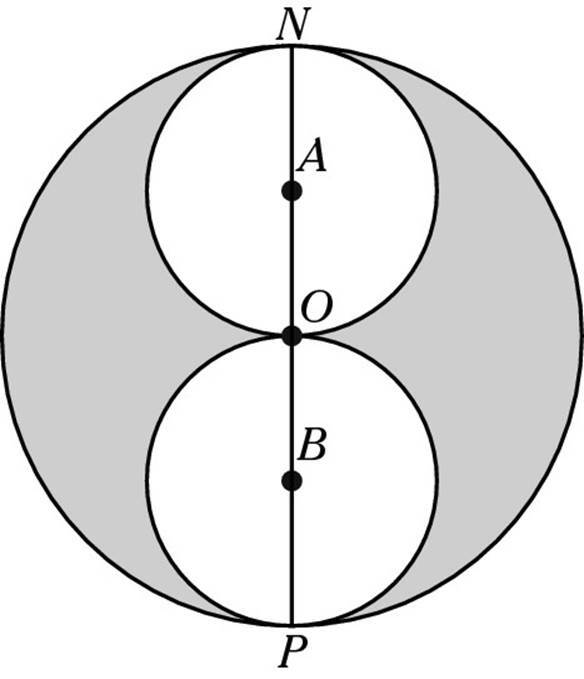 If a = 1⁄2, b = 2⁄3, and c = 5⁄8, which of the following is true? 3. Given that f(x) = x3, for which number is f(x) < x? 8. What is the total area of the trapezoid pictured above? Directions for student-produced response Questions 9–18: Solve the problem and then write your answer in the boxes on the answer sheet. Mark the ovals corresponding to the answer, as shown in the following example. Note the fraction line and the decimal points. Although you do not have to write the solutions in the boxes, you do have to blacken the corresponding ovals. You should fill in the boxes to avoid confusion. Only the blackened ovals will be scored. The numbers in the boxes will not be read. There are no negative answers. Mixed numbers, such as 31⁄2, may be gridded in as a decimal (3.5) or as a fraction (7⁄2). 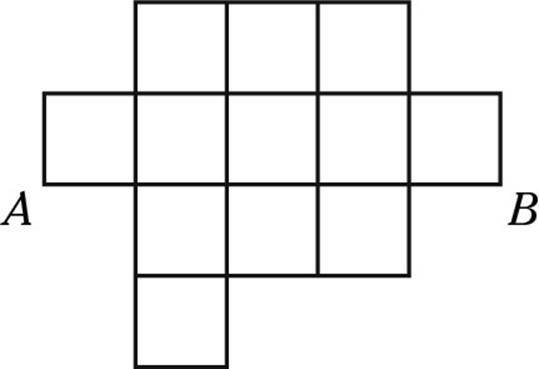 Do not grid in 31⁄2; it will be read as 31⁄2. Grid in a decimal as far as possible. Do not round your answer and leave some boxes empty. A question may have more than one answer. Grid in one answer only. 9. If x + 100 = 2x, what is the value of x? 10. 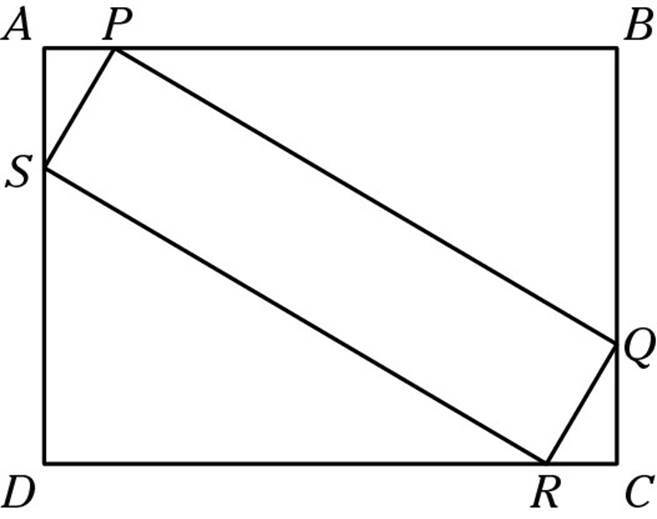 A rectangle’s length is twice its width. If its area is 32 square inches, find its width, in inches. 11. The height of an object thrown in the air with an initial velocity of 96 feet per second can be modeled by the function , where h is in feet and t is in seconds. What would be the ball’s maximum height, in feet? 12. If 20 percent of half a number is 17, what was the original number? 13. 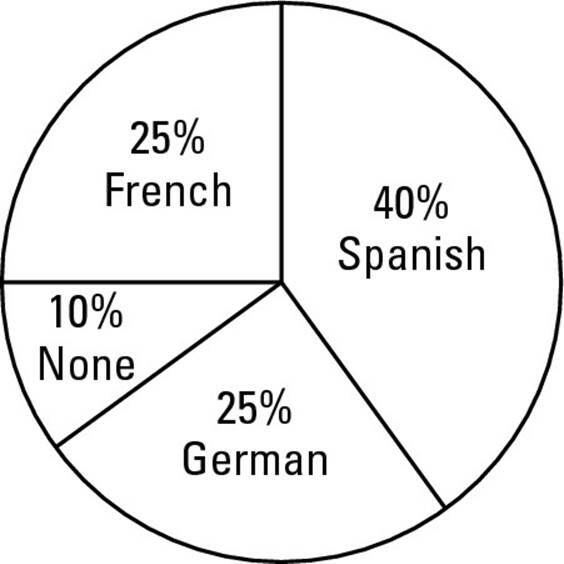 The pie graph above shows the percentage of students who take each foreign language at a certain high school. 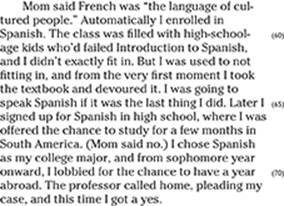 If 260 students take either French or Spanish, how many students go to the school? 14. 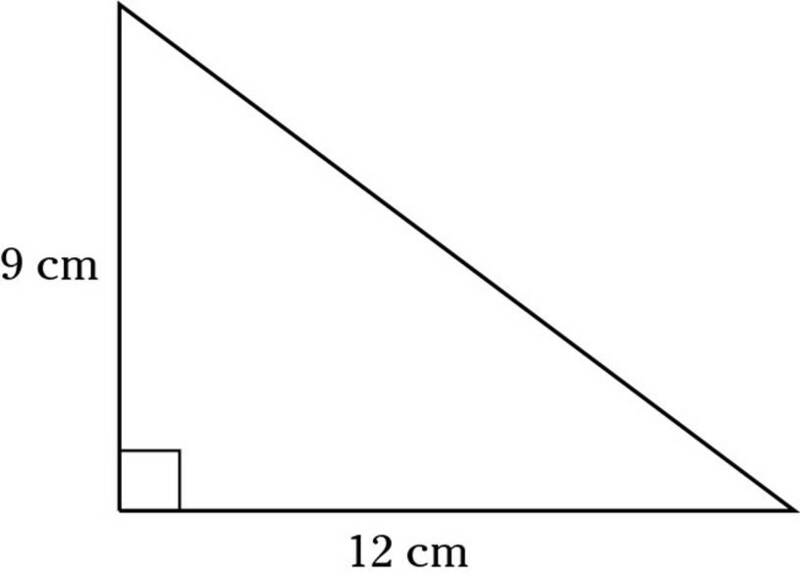 If the area of an equilateral triangle is , find the length of one of its sides. 15. If w2 – v2 = 54 and w – v = 9, find the value of 2w + 2v. 16. What is the value of the smallest number that is divisible by 2, 3, 4, 5, and 6? 17. 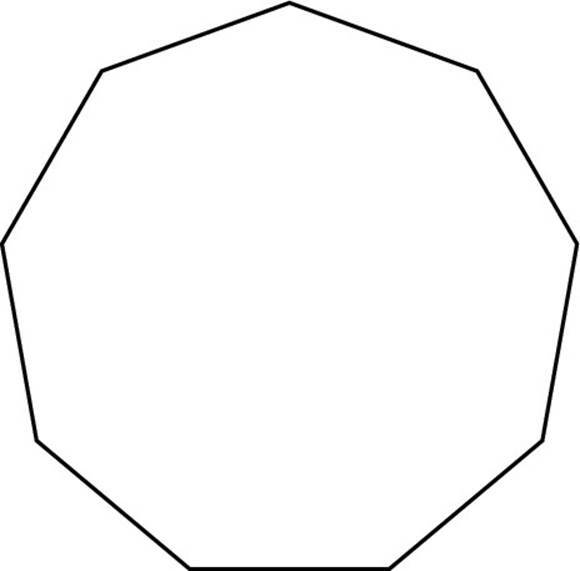 The polygon shown has nine sides. How many additional lines must be drawn in order to make sure that every vertex (corner) is connected to every other vertex? 18. Car rental company A charges $80 per day, plus 25 cents per mile driven. Car rental company B charges $100 per day, plus 10 cents per mile driven. If you plan on renting a car for 3 days, for what number of miles would the costs of the two cars be equivalent? Directions for Questions 1–5: Select the answer that best fits the meaning of the sentence. 1. In everyday conversation and in the media, the new constitution was debated, though no _____ emerged. 2. The goal of the seminar was not only to share information but also to build a(n) _____ group that would trust and depend upon each other. 3. The executive is known for his _____ style of leadership; his subordinates know that he wants to hear their opinions and ideas, however contrary to the executive’s own views. 4. Compared with negotiations for other properties, which ended in lawsuits and ill will, working out the lease for that office building was a relatively _____ process. 5. Her daily strolls gave her insight into the _____ rhythms of the neighborhood. Directions for Questions 6–9: Choose the best answer to each question based on what is stated or implied in the passages or in the introductory material. 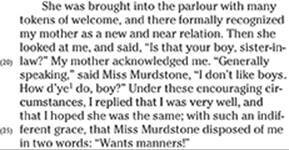 The first passage is excerpted from a 1919 book titled Vocational Guidance for Girls by Marguerite Stockman Dickson. 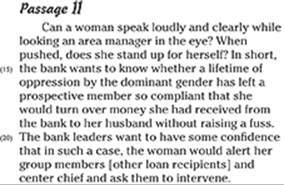 The second is drawn from Small Loans, Big Dreams by Alex Counts (Wiley) and describes part of the screening process of a bank that awards small loans to poor women in Bangladesh and other countries. 6. With which statement is the author of Passage I likely to agree? (A) Behavior is individual, not related to one’s gender. (B) Women and men can do the same work. 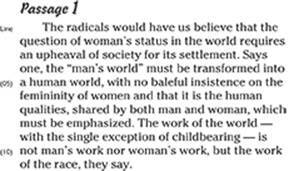 (C) Society is properly organized with regard to gender. (D) Men should share in the work of ­child-rearing. (E) More women should work outside the home. 9. The author of Passage II favors which of the following as a support system for ­borrowers? Directions for Questions 10–15: Choose the best answer to each question based on what is stated or implied in the passage or in the introductory material. 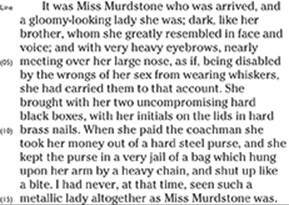 The passage is excerpted from a 19th-century novel. Directions for Questions 16–24: Choose the best answer to each question based on what is stated or implied in the passage or in the introductory material. 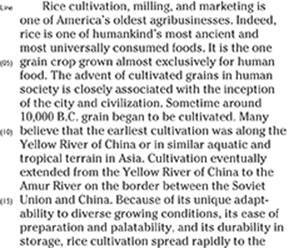 The passage is excerpted from Rice: Origin, History, Technology, and Production (Wiley). 21. 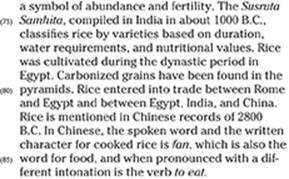 Which statement from Paragraph 3 (Lines 44–63) justifies the “prominent place in history” that rice “deserves” (Line 63)? 22. Which title best expresses the main idea of paragraph four? (B) was mentioned in Chinese records of 2800 B.C. Directions: Choose the best answer and darken the corresponding oval on the answer sheet. All figures may be assumed to be to scale unless the problem specifically indicates otherwise. 4. In an 11th-grade math class, five students have no pets, eight students have one pet, four students have two pets, two students have three pets, and one student has four pets. What is the average number of pets per student in this class? 5. Which expression represents the number of cents, c, that a customer received from a one-dollar bill after buying n candies each costing 5 cents? 6. At a certain high school, the ratio of boys to girls is 4:5. Which number could not represent the total number of students in the school? 8. Given that x and y are positive integers, and that (xy) – (x + y) is even, which of the following must be true? (A) Both x and y must be even. (B) Both x and y must be odd. (C) Either x or y must be even. (D) Either x or y must be odd. (E) One of the two numbers must be even, and the other one must be odd. 11. The factors of a positive number n are all the positive numbers that n can be divided by without leaving a remainder; this includes 1 and n itself. For example, the factors of 10 are 1, 2, 5, and 10. How many positive numbers less than 50 have an odd number of factors? 12. To go on a certain amusement-park ride, you must be at least 50 inches tall, but not taller than 70 inches. Which of the following is an inequality that represents h, the height of people allowed to go on this ride? 13. 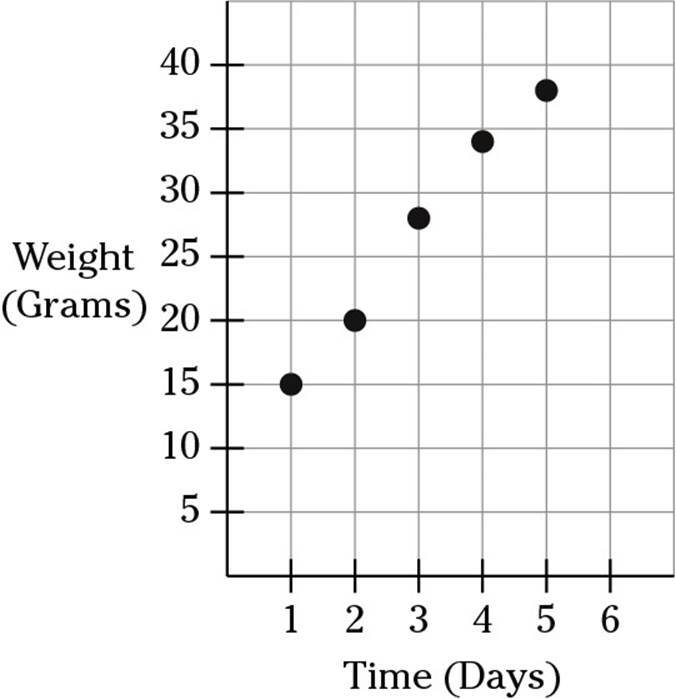 The graph above shows the weight of a hamster, in grams, over a period of several days. The linear function that best models the hamster’s weight, w, as a function of its age in days, a, is which of the following? 14. If x3/4= 641/2, what does x equal? 15. 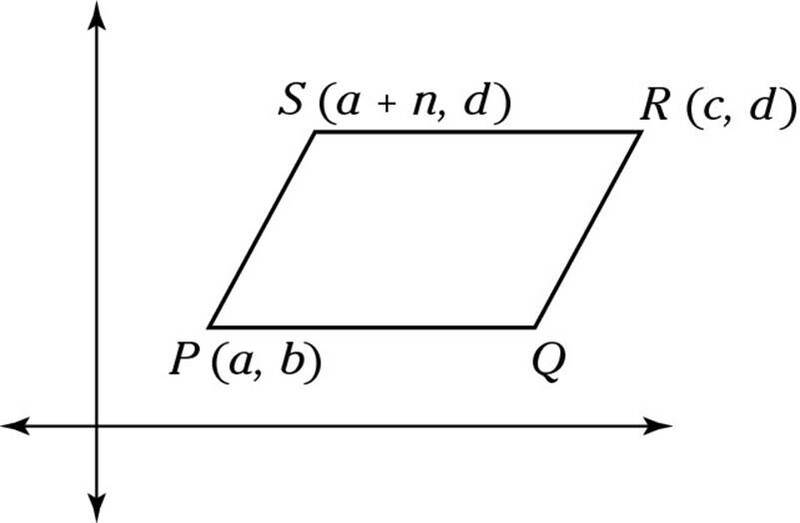 Which of the following equations has 3 as a solution? 17. 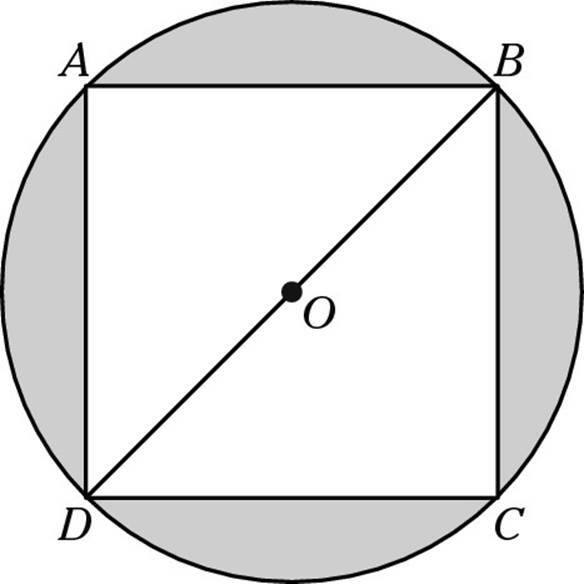 If the diameter of circle O is 10 cm, and ABCD is a square, then the area of the shaded region in cm2 is which of the following? (E) There is not enough information given. Directions for Questions 1–11: Each sentence is followed by five choices. Decide which choice best improves the sentence. If the underlined portion of the sentence is best left alone, choose (A). Example: Bert and him went to the store to buy boots in preparation for the approaching storm. 1. After the fight, Justin’s new coat was equally as ripped as Anthony’s. 2. The municipal government, concerned about the number of traffic accidents involving bicycles, has passed a law requiring registration of every vehicle, it takes effect on January 1. 3. 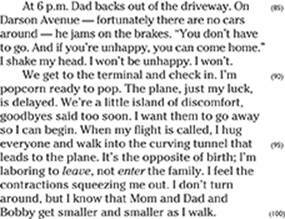 Libby’s grandfather, who carries several sets of keys, sets off the metal detector at airports more often than her relatives. 4. During the first act of the play, the spotlights wobbled a little, and it had destroyed the actors’ concentration. 5. Selecting a new chief executive, the problems facing the company seemed more manageable to the trustees. 6. The most common reason for computer crashes is that the operating system code contains an error. 7. 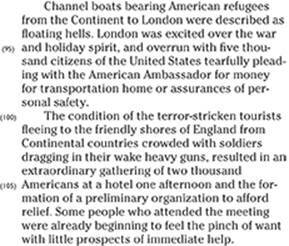 The unclaimed package, which was wrapped in brown paper and which was tied with string, attracted a great deal of attention. 8. Rushing to the meeting before the comfortable blue chair was taken, the seat was discovered to be occupied already by Alex. 9. The ability to ski, ice-skate, and knowing karate were all skills Darian worked hard to perfect. 10. British writer Jane Austen lived in small towns most of her life, living in rural areas except for a short period when she lived in the city of Bath. 11. The reporter for that metropolitan paper, as well as many other representatives of the media, has been pressured to identify confidential sources. Directions for Questions 30–35: These questions are based on the following essay. Choose the best answer to each question. 30. Which sentence would be a good first sentence for Paragraph 1? (A) Teenagers should be taught about nutrition. (B) Making good choices is something that should be taught in school. (C) School cafeterias should serve nutritious food, but many do not. (D) It is a problem when you consider the kind of food served in school. (E) Eating properly is important. 31. 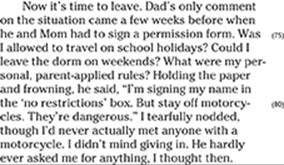 Which sentence, inserted before Sentence 4, would be a good introduction to Paragraph 2? 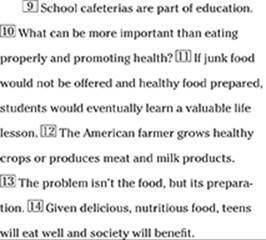 (A) The selection of food offered in a high school cafeteria is not based on health. (B) Economics and taste are important. (C) Neither economics nor taste matters in the cafeteria. 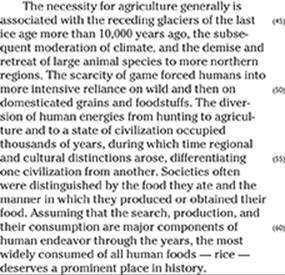 (D) American farmers grow too much food. (E) Some farmers sell their crops to the government. 32. Which sentence below represents the best combination of Sentences 4 and 5? (A) Some cafeteria food is bought by the government from surplus food grown by farmers. (B) Cafeteria lunches are made of government surplus food. (C) Bought from farmers, the government distributes surplus food to children as school lunches. (D) Some cafeteria food comes from surplus crops, and the government buys the food from farmers and gives it to school children. (E) Some cafeteria food comes from surplus crops, which the government buys from farmers and distributes in the form of school lunches. 33. Which sentence represents the best revision of Sentence 8? (A) A student will put good food on his or her plate, but if you don’t like the taste, you’ll throw out the food. (B) Students put good food on their plates, but if they don’t like the taste, they’ll throw out the food. 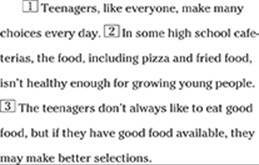 (C) Students, who put good food on their plates, throw it out if the taste isn’t liked. 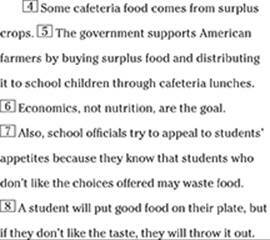 (D) Even though a student selects good food, they may not eat it and instead throw it out. (E) Students who select good food for their plates and don’t like it, throw it out. 34. The best revision of the portion of Sentence 11 shown below is which of the following? 35. 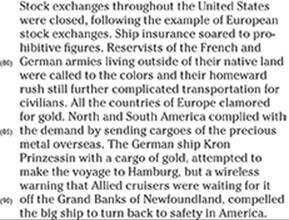 Which sentence(s) should be removed from the last paragraph of the essay? Directions for Questions 1–6: Select the answer that best fits the meaning of the sentence. Example: After he had broken the dining room window, Hal’s mother __________ him. 1. George pretends that his talent is _____, but he has practiced many hours each day for years to perfect his skills. 2. “Walking on eggshells” and other common expressions create _____ images. 3. The boxer hopped from foot to foot in an effort to _____ his opponent’s punches. 4. The tiny cottage filled with old-fashioned furniture and devoid of modern appliances struck the visitor as _____. 5. 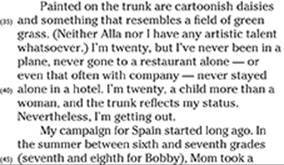 The artist, early in her career, was not just _____ but actually _____. 6. Despite the drop in temperature, patches of ice _____. Directions for Questions 7–19: Choose the best answer to each question based on what is stated or implied in the passage or in the introductory material. 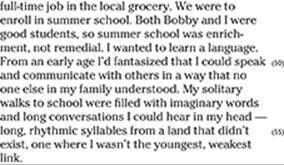 The passage is an excerpt from a memoir of a young woman setting off for a year of study abroad. 16. 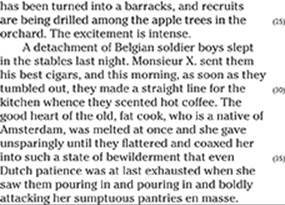 Which of the following best expresses the meaning of “I’m popcorn ready to pop” (Lines 90–91) in the context of this passage? (A) The situation is stressful. (D) I am ready to start a new life. (E) It is hard to say goodbye. what value(s) of x would the function equal 25? 8. A bag of candy was divided among four children. The first child got exactly one-fourth of the candy. Then, the second child got one-third of the candy that was left. Next, the third child got one-half of the candy remaining. Finally, the fourth child got everything left over. Which child now has the least candy? (A) The first child got the least. (B) The second child got the least. (C) The third child got the least. (D) The third and fourth children are tied for the least. (E) All four children got the same amount of candy. 10. 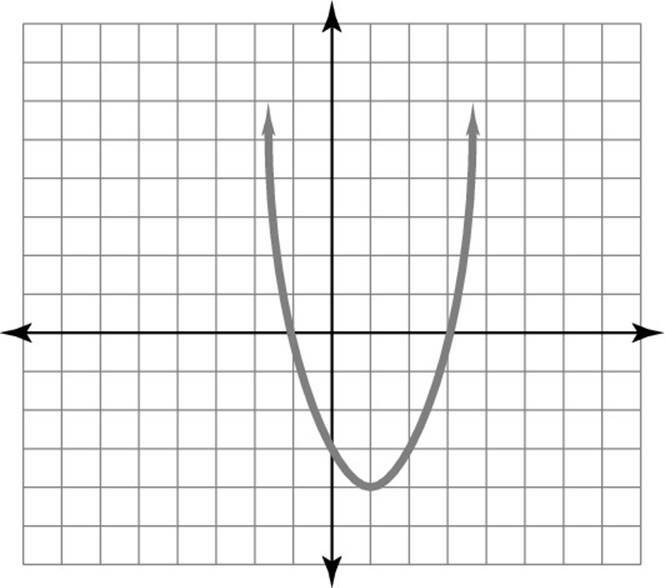 The graph above shows y = f(x). 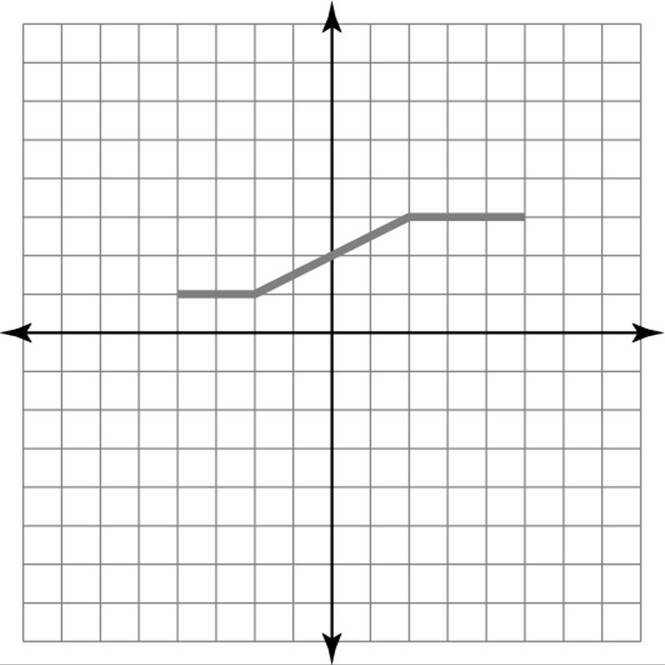 Which point would have to appear on the graph of y = 2f(x) + 4? Which of the following would equal 14? 15. In a deck of 12 cards, each card has one of the symbols below on each side. Some cards have the same symbols on both sides; some cards have different symbols. 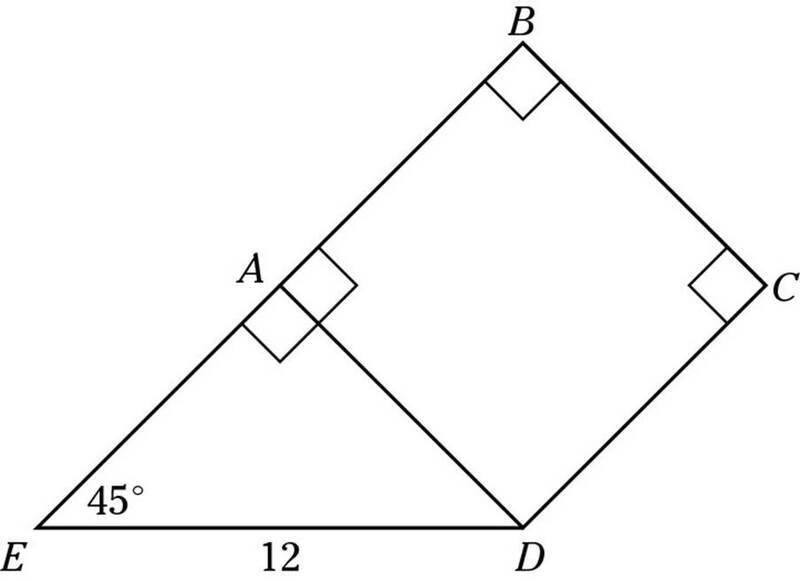 If every symbol appears on at least two different cards, and Symbols A and B together appear on a total of 13 sides, what is the maximum number of cards that could have Symbol D on both sides? Directions: Each sentence is followed by five choices. Decide which choice best improves the sentence and darken the corresponding oval on the answer sheet. If the underlined portion of the sentence is best left alone, choose (A). 1. When they had heard about an Etruscan chariot on display at the Metropolitan Museum of Art, the citizens of the Italian town where the chariot was unearthed immediately claimed ownership. 2. Amy Tan, whose novels explore the lives of Asian Americans, included elements of Chinese culture and history in her work. 3. No one disputes his patriotism, nor can anyone challenge his integrity. 4. Many public works programs of the Depression era were intended in creating jobs for the unemployed. 5. Ancient Egyptian scribes sat cross-legged and wrote on “desks,” with them being their cloth kilts stretched tightly across their knees. 6. Construction projects which appear to start slowly, with months of work going into preparation of the site and foundation, before the skeleton of the building rises quickly. 7. The best applicant for a position in technical services is good at detail, calm during interactions with customers, and knows about the devices a company sells. 8. Whether genetically engineered crops are a benefit or a danger, it is a matter of controversy. (A) Whether genetically engineered crops are a benefit or a danger, it is a matter of controversy. (B) Whether genetically engineered crops are a benefit or a danger is a matter of controversy. (C) If genetically engineered crops are a benefit or a danger, is a matter of controversy. (D) Genetically engineered crops are a benefit or a danger, and people think it is a matter of controversy. (E) Controversially, genetically engineered crops are a benefit or a danger to many people. 9. 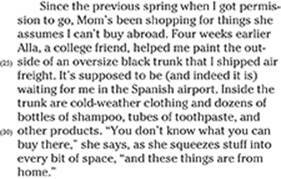 Having learned Spanish and English as a child, Eleanor is fluent in both languages. 10. The philosopher was so intent on making her argument, and she was walking into a wall of the coffee shop. 11. Seattle’s Space Needle is not only a symbol of the city but it also attracts tourists because of its unparalleled view. 12. After viewing the elephants, lions, and tigers, the sea lions are a real treat. (A) After viewing the elephants, lions, and tigers, the sea lions are a real treat. (B) After having viewed the elephants, lions, and tigers, the sea lions are a real treat. (C) The elephants, lions, and tigers having viewed, the sea lions are real treat. (D) If a person views the elephants, lions, and tigers, the sea lions are a real treat to them. (E) After viewing the elephants, lions, and tigers, you’ll find that the sea lions are a real treat. 13. All over the park are thousands of trees, the variety including exotic species and the more common domestic oaks and maples. 14. Although painted wooden statues are popular with tourists, most artists in that area have long since moved on to other media.